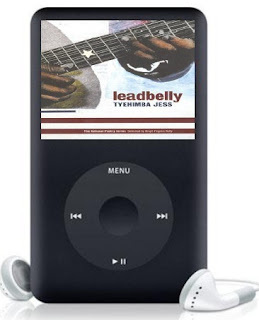 At a poetry reading on November 2, 2005, at SIUE, Tyehimba Jess performed a polyrhythmic and emphatic rendition of his poem “leadbelly sings to his #1 crew.” The performance had the force of a steaming locomotive work song mixed with the fiery testimony of a bad-man folk singing convict. The performance illustrated a poet’s ability to retain, shuffle, and play multiple modalities of black speech and folk music. In other words, Tyehimba JEss was like a human iPod. Of all the volumes of poetry out there filled with persona poems, few individual books contain as many characters as Jess's leadbelly. Jess takes on the personas of more than two dozen characters. His volume contains testimonies from Leadbelly, his girlfriends and later his wife, his mother, his friend and mentor Blind Lemon Jefferson, his one-time handler John Lomax, his associates, his guitar, and many more. That all those figures are downloaded, so to speak, onto this one book and brought to life in Jess's live performances are what lead me to refer to him as a kind of human iPod. I'm mostly being suggestive or imaginative about the idea of a single poet displaying the abilities to store and replay the narratives and songs of so many different voices. Of course, Jess's work with leadbelly is the result of considerable research and creativity. Unlike many first official volumes of poetry, Jess's book has a decidedly clear focus. But that does not mean the book lacks diversity. On the contrary, all the many characters and forms (sonnets, prose poems, double-jointed poems, founds poems, and epistolary poems) make leadbelly quite multidirectional. All these tracks. All these voices. All these forms. All in on one book. It's like a portable media player passing for a volume of poetry.